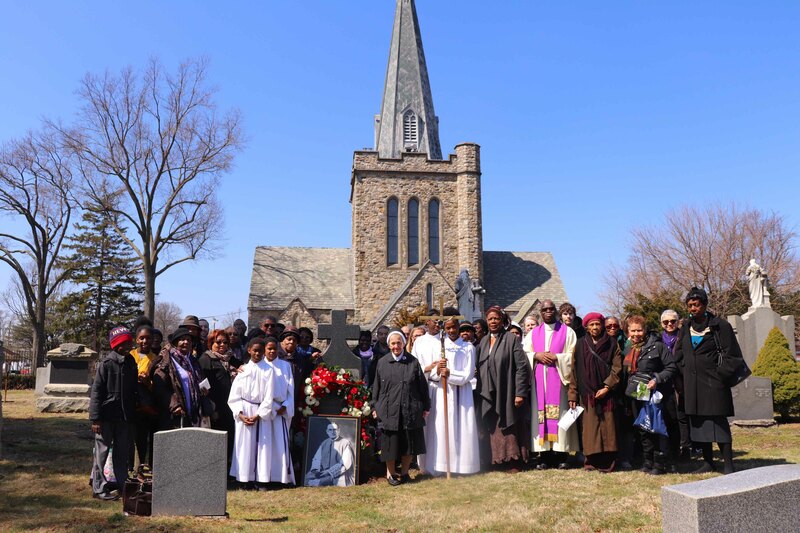 A faithful delegation of Catholics from Long Island, including the Diocese of Brooklyn, gathered early on a Saturday morning to pray at the burial site of Msgr. Bernard John Quinn, April 6. Some came to ask for intercessions for healing, some as a way to show their gratitude for prayers answered and some because they wanted to show their respect for this giant in local Catholic history, who fought for the marginalized black population and refused to be scared off by the Ku Klux Klan, no matter how many times they burned down his orphanage. The delegation gathered in a historic little church dedicated to St. Brigid in Westbury for Mass offered by Msgr. Paul Jervis, the priest leading the canonization cause for the declared Servant of God. Msgr. Quinn, the son of poor Irish immigrant parents, fought for those who were rejected on the basis of their black skin, not only by society but even the Catholic churches of Brooklyn and Queens. He founded churches that would minister to people of all kinds, declaring the divine dignity of each human being. When he saw the droves of black children being orphaned because of a desperate poverty in the 1920s he opened an orphanage in Wading River, Long Island, that would not only care for their bodily needs but also do its best to care for their mental and spiritual well-being. He continuously fought for the children, looking to provide them with the best teachers, resources and care. The Ku Klux Klan, of course, did not take well with his efforts and burned down the Little House of Providence twice in one year. The Klan’s acts and words of terror did not deter this priest who wanted to follow Jesus fully. “I would willingly shed to the last drop of my life’s blood for the least among you,” the Servant of God said famously – a declaration backed up by his life’s work. Maureen Fox, the vice president of external affairs and communications of Little Flower Children Services of New York, said her organization’s founder continues to be a living part of the ministry. 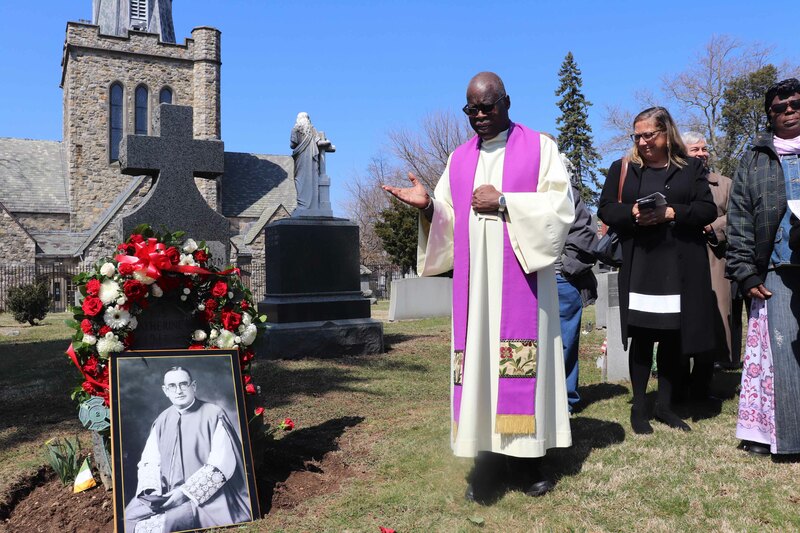 “We count on him for guidance,” she said after the April 6 Mass commemorating the 79th anniversary of his death. The organization has a chapel dedicated to his name and has rededicated a street in his name. She said these physical manifestos are important to help new generations understand history and the work of this good priest. Bernice Brown, the secretary for Father Quinn’s Guild, believes it was the Holy Spirit who brought the priest into her life. She explained that the people in her parish of St. Martin de Porres parish, Bed-Stuy, which now includes the worship site of St. Peter Claver, were not as well aware of Msgr. Quinn’s legacy until Msgr. Jervis, who was their pastor at the time, brought it to their attention. She said she had found it mind-boggling that there was such a person that was willing to give up so much for the people of the area. Now she counts herself as among the beneficiaries of his good works. “He is someone you could look to for guidance,” she said, because he held nothing back. “Msgr. Quinn is like my little brother,” said Merle Fredrick, who also came for the Mass from Brooklyn. She explained that she sees the Servant of God as someone whom she can rely on to help her in everyday situations from the most mundane to the most important. She credits Msgr. Quinn with helping her finally pass the GED exams at 74 years of age. She was determined to gain her high school equivalency diploma, but was struggling with the written portion. So she decided to pray to an American holy man to help her out – sure enough he pulled through and she was able to pass her exams. Fredrick has taken to speaking with Msgr. Quinn on a daily basis at all times of day and night. She said he helps her to give good advice and has interceded to help heal family and strangers alike. Fredrick has recounted her testimony to the book-long report sent to the Vatican in favor of his canonization. Msgr. Jervis has been working on Msgr. Quinn’s canonization for more than 30 years. His work cumulated in a book detailing the priest’s saintly words and actions. An independent diocesan inquiry then took place on the validity of Msgr. Jervis’ claims. During his homily at the memorial Mass, Msgr. Jervis explained that the investigation not only confirmed what he wrote but discovered further evidence of the late priest’s saintly qualities. The entire report has been sent to the Vatican and is due back in the near future, Msgr. Jervis explained. He hopes for a great celebration when the results are announced. “I don’t think the Church of Long Island has been the same since this priest,” Msgr. Jervis said. Catholics from throughout Long Island, including the Diocese of Brooklyn, who have a special devotion to Msgr. John Quinn, gathered to pray at the Servant of God’s gravesite on the occasion of the 79th anniversary of his death.